“The Oath” presents itself as part holiday comedy, part sociopolitical satire, and all political progressive nightmare. In terms of its target audience, the film presses all the right buttons to check all those boxes. Arguably, it pushes them too well, and the final result is more depressing than funny. “The Oath” presents itself as part holiday comedy, part sociopolitical satire, and all political progressive nightmare. In terms of its target audience, the film presses all the right buttons to check all those boxes. Arguably, it pushes them too well, and the final result is more depressing than funny. 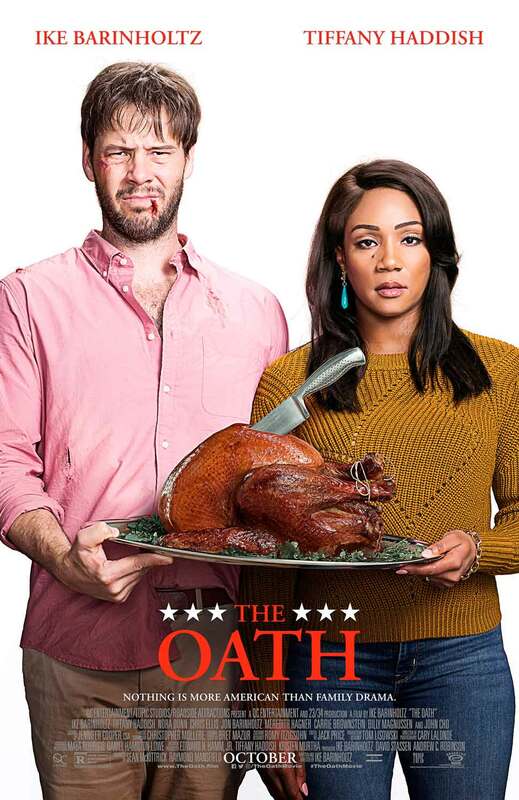 “The Oath” examines a week in the lives of Chris (Ike Barinholtz, “Blockers“) and Kai (Tiffany Haddish, “Girls Trip“). It’s no ordinary week for the married couple. In fact, it’s a week many families in America dread maybe more than they should. It’s Thanksgiving week, and the extended family is coming to town. Coincidentally, it’s also the week a controversial White House policy deadline hangs over their heads. Months prior, the president (who is unnamed in the film) asked all Americans to sign a personal pledge of loyalty to him. The deadline to sign is Black Friday, the day after Thanksgiving. What happens if you don’t sign? Nothing, according to the president’s press secretary. But if you do, the government promises certain perks. To the cable news-obsessed Chris, this “Patriot Oath” represents a terrifying prospect. He and Kai pledge never to sign it, then watch as more people sign in the face of the looming deadline. Suffice to say, Chris is more or less a basket case by the time his parents, his sister Alice (Carrie Brownstein, “Portlandia“), his younger brother Pat (Jon Barinholtz) and Pat’s girlfriend Abbie (Meredith Hagner) start walking in the door. It’s important to mention that Pat’s a bit of a frat boy, and Abbie, well, she’s enjoys “mixing it up” with “liberal snowflakes” online. With Chris about to lose his mind, it falls to Kai and Alice to try to keep the peace. And just when things seemingly cannot possibly get worse, two men from a new division of the Department of Homeland Security show up at the door. They want to speak to Chris. It seems he’s been telling people not to sign the Patriot Oath. That’s a problem, and that’s when things really get interesting. 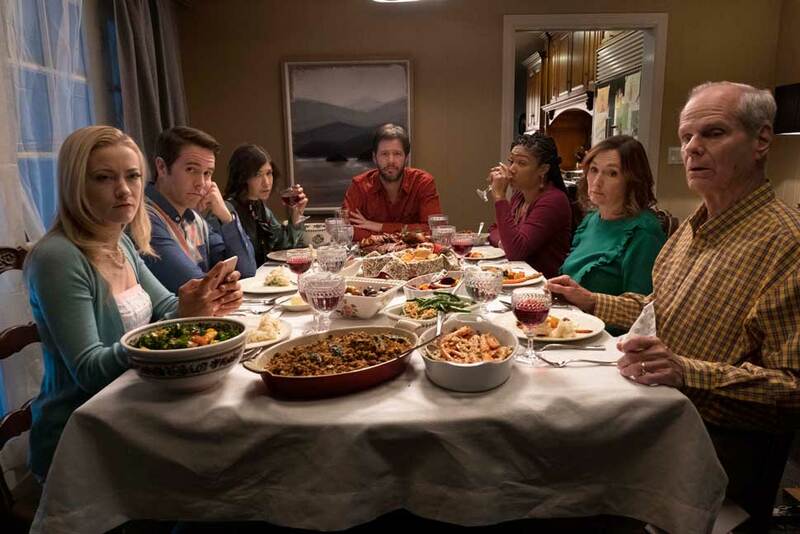 There’s no doubt Ike Barinholtz, who wrote and directed “The Oath” as well as starred in it, wants his film to hit close to home with viewers. The characters he writes, the situations he describes, should feel very familiar. In today’s tense and tribal times, we’ve all had these kinds of encounters with family, with friends, with total strangers in real life and online. His character in particular should feel very familiar. He’s that person in your life who can’t talk about anything else but the news these days, whose anxiety seems to grow with every online article he or she reads. To be fair, Barinholtz does make an effort at balance in his script. Not everyone around Chris is an extreme stereotype, and Chris’s own behavior at times comes across as loutish, even with his supposedly “well-informed” views. But by making Chris the film’s primary viewpoint character, any effort at balance is simply pretense. That effort, by the way, all goes out the window once the film’s plot takes a very dark turn that in essence proves all of Chris’s fears correct. The result is a film that’s likely to be as polarizing as the times it lampoons. For those who see the world the way Chris does, it will feel akin to “Invasion of the Body Snatchers.” For those on the opposite side of the spectrum who choose to see the film at all, it most likely will come off at differing times as insulting and alarmist. Compounding the screenplay and slant issues with “The Oath” is the fact that the film is Barinholtz’s debut directing a feature film. Previously, his directing experience has been in TV comedies, and he brings that approach to his visual storytelling here. As a result, the first two acts of “The Oath” feel more like a series of comic sketches rather than a cohesive narrative. Scenes built around comedic beats don’t flow into one another, but instead transition awkwardly using a similar set-up over and over again. It’s only when the whole thing veers away from situational comedy in the third act that “The Oath” starts to feel like a movie. But by then, of course, it’s too late. All that said, it’s tough to recommend going out of your way to see “The Oath” in theaters. There’s nothing in the film’s presentation that demands it be seen on big screens. On the contrary, it may even look better seen on TV, as so much of it feels like episodes of a sit-com. Plus, for some people the holidays and election season are stressful enough in real life. Watching these people drive themselves crazy doesn’t exactly provide relief. Does all that mean that what Barinholtz has to say in “The Oath” is without merit? Not at all, and the film’s release date is certainly no coincidence. But the lack of subtlety and balanced perspective, the fact that so many of the film’s attempts at humor come at the expense of one side, defeats much of the film’s levity. Starring Ike Barinholtz, Tiffany Haddish, Nora Dunn, Chris Ellis, Jon Barinholtz, Meredith Hagner, Carrie Brownstein, Billy Magnussen and John Cho. Directed by Ike Barinholtz. Rated R for language throughout, violence and some drug use.